This Chain Reaction Research (CRR) report analyzes the financial risk profile of Bumitama Agri Ltd. (BAL:SP), a rapidly growing palm oil company. We looked at sustainability risks associated with the group’s 204,000 hectare (ha) land bank in Kalimantan, Indonesia – an area that the company identifies as available for plantation development. Detailed analysis of 16 of the group’s 18 plantation subsidiaries shows that Bumitama has been involved in significant deforestation, peatland development and legal irregularities since the group entered the plantation business in 1998. Continuation of such practices places the group at serious risk of losing its two major customers. Wilmar International and Golden Agri-Resources (GAR) together purchase approximately 90 percent of Bumitama’s palm oil supply. As of early 2014, both companies have adopted stringent sourcing policies that disqualify third-party suppliers who engage in deforestation, peat development and social exploitation. In the months since, Bumitama has taken several steps that may mitigate some of the worst risks. In this report, CRR reviews how Bumitama accumulated its sustainability risk profile over the years, and assesses the potential financial consequences should the group fail to duly address its sustainability risk exposure. An earlier version of this report was sent to Bumitama Agri for review, and this final report integrates information from its response. At the core of our Sustainability Risk Assessment (SRA) is an analysis of how much of a company’s land bank may be “contested land” – i.e. covered by limits to plantation development imposed by law, the Roundtable on Sustainable Palm Oil (RSPO), buyer and investor policies or land disputes with communities and other companies. 41 percent of Bumitama’s 204,000 hectare land bank – 83,000 hectares of land – is potentially or de facto contested. Though that amount has fallen over the past six months, it is still on the medium-high range for palm oil companies. Over 80 percent of recorded contested land can be settled through established government and RSPO procedures, which require that the company reserve significant budget for land compensation. Around 14,400 ha are however more seriously contested, as due to a recent Supreme Court ruling rights are lost over 7,100 ha and 7,300 ha of forestland could be reclaimed by the Ministry of Forestry. Additionally, Bumitama may lose rights due to overlapping claims with other companies, especially mining interests not linked to the Harita Group. With 23 percent of its land bank dedicated to smallholders, the group exceeds the mandatory 20% target and outperforms many other growers on this measure. However, Bumitama has yet to help resolve two significant land conflict cases involving smallholder schemes in Central Kalimantan. In order to resolve unauthorized forestland occupation of almost 40,000 hectares, Bumitama has sought amnesty for 32,400 hectares. If approved by the Ministry of Forestry, the company will be required to finance forest restoration at an estimated cost of USD 86.7 million. While significant, this cost is likely to be bearable by the company. CRR did not assess Bumitama’s “compensation debt” in detail. We estimate it may have to settle with RSPO an area of 20,000 hectares, just for forest cleared between 2010 and 2013. Bearing in mind the forest types cleared, we estimate the compensation at USD 30 million in cash value. Compensation may also be settled in kind on its own land bank or through restoration projects elsewhere. Bumitama had recently announced that it would set aside an additional 8,500 ha of High Carbon Stock forest and peat land that would contribute to a settlement. NGO investigations in 2013 and 2014 revealed that commitments by Bumitama’s senior management to halt land development on the ground had not been fully implemented. Consequently, RSPO eventually slapped the company with several “stop-work orders” while Bumitama’s key buyers put pressure on the company to rapidly address the issues in the supply chain. If Bumitama’s senior management does not settle historical wrongdoings and uncontrolled development is left unaddressed, then the group would be exposed to the serious risk of seeing its two main buyers suspend or cancel supply contracts. If its most important customer, Wilmar International, were to stop purchasing Bumitama’s palm oil, the company’s revenue would decline an estimated 43% in 2015 before recovering somewhat in 2016 if the company could find new customers. Under this scenario, Bumitama would experience a negative Return on Equity (RoE) in 2015. Depending on its ability to cut its existing contracts with external FFB suppliers, the company could regain some profitability in 2016. However, should Wilmar’s decision to cancel its contracts be followed by its second largest buyer, Golden Agri-Resources, then the outcome would be disastrous. The two buyers represent about 90% of Bumitama’s market. Although Wilmar and other trader-refiners with third-party supplier policies do not disclose contract suspensions and cancellations, the financial implications of such measure represent a powerful threat to numerous plantation groups. For a pure grower like Bumitama, the impact of contract cancellation would be especially devastating. Ended three management contracts with third parties who claimed rights over highly contested land bank. Engaged with NGOs to resolve several formal complaints and grievances filed with RSPO, most of which are now in the final stage of resolution. Embraced the concept of High Carbon Stock (HCS) for five estate subsidiaries with remaining undeveloped land. On 12 September 2014, Bumitama announced it would exclude an additional 8,500 ha of forest and peatland from development, in addition to other conservation areas already set aside. Bumitama is in the process of finalizing its review and reformulation of its sustainability policy, which is scheduled to be published in late 2014. Bumitama is working to become an industry leader, but the company has yet to resolve a variety of issues within its remaining contested land bank. The company is likely to have to surrender more land bank because of non-compliance with law, in addition to RSPO and market requirements. Bumitama Agri Ltd. (BAL: SP) was first listed on the Singapore stock exchange in April 2012 and has a market capitalization of USD 1.72 billion. Bumitama is majority-owned by the Hariyanto family from Indonesia, whilst the Malaysian IOI Corporation (IOI) owns a 31% stake in the company. In addition, Bumitama and IOI operate several joint ventures together. With revenues of USD 392.2 million and a net income of USD 82.6 million in 2013, Bumitama showed a high net profit margin of 24.2% and a Return on Equity (RoE) of 15.2%. The development of key financial figures and financial ratios of Bumitama Agri is further discussed in section 3. Figure 1 shows where Bumitama Agri’s oil palm plantations and CPO mills are located in Indonesia. Around 54,369 hectares (27% of the company’s total land bank) was not planted at the end of 2013. Because this area is not fully available for future plantings as it includes areas designated for conservation, roads and buildings, the potential to expand the planted area is smaller. In 2014, Bumitama Agri aims to plant 8,000 hectares.3 CRR expects that the company will fall short of this target due several “stop work orders” issued by the RSPO pending resolution of several complaints that affected expansion plans in several estates in West and Central Kalimantan. Bumitama Agri operates eight CPO mills with a total FFB processing capacity of 3.1 million metric tonnes per annum, located in close proximity to its plantations.5 In 2014, a new CPO mill will become operational to expand its FFB processing capacity to 4.0 million tons per year.6 Table 4 shows that the volume of FFB processed in 2013 (2.2 million tonnes in 2013) is well below the (future) capacity of its CPO mills. Bumitama Agri’s yield figure (17.4 tons of FFB per hectare) is still below competitors like Astra Agro Lestari (20.7 tons/ha)8 and SMART (22.4 tons/ha)9, due to the lower maturity rate of its plantations. In the medium and longer term, yields are expected to increase as its plantations mature and reach peak production. Table 5 shows that Bumitama Agri’s sales were largely dependent on two major customers, Wilmar International and Golden Agri-Resources, in 2011 and 2012. For 2013, no sales figures per customer are available but Bumitama Agri revealed that its two main customers (i.e. Wilmar and GAR) represented 91% of total sales.10 As detailed in section 4 onthe financial risk assessment, losing one or both of these customers due to non-compliance with the traders’ “No Deforestation” policies is probably the single biggest risk to Bumitama’s future financial performance. Lim Hariyanto and his son Lim Gunawan Hariyanto, the present group executive chairman and CEO, own 50.9% of the shares of Bumitama Agri. This makes the company into one of the key pillars of the Harita Group, a conglomerate founded by the Hariyanto family, which is primarily engaged in bauxite and nickel mining and presently investing in alumina and nickel smelters13, logging and wood processing.14 The group’s business activities all are located in Indonesia. As a summary of all land-related issues described in previous sections, section 2.8 calculates Bumitama Agri’s contested land percentage. Finally, section 2.9 discusses how the sustainability risk which Bumitama Agri is facing could affect its co-owner IOI Corporation. According to satellite imagery analysis by Chain Reaction Research, an area of about 20,000 ha has been deforested in the period 2010-2013 within the land bank of Bumitama Agri, with the Central Kalimantan plantations of PT Hatiprima Agro (4,000 ha) and PT Karya Makmur Bahagia (3,000 ha) as main examples.18 The bulk of this forest represented actual or potential orangutan habitat.19 In Indonesia, it is illegal to hunt or otherwise kill orangutans but habitat conversion is not considered illegal at this time. Nonetheless, the conversion of orangutan habitat represents a major international reputation risk to any company group that is associated with further endangering the species. In its 2012 annual report, published in March 2013, Bumitama Agri stated that its policy was to “refrain from putting at risk areas of High Conservation Value (HCV) interest or habitats important for endangered plant or animal species.”22 However, International Animal Rescue filed a complaint with the RSPO against Bumitama Agri for clearing orangutan habitat in 2013 in the concession area of its subsidiary PT Ladang Sawit Mas (LSM) in West Kalimantan, as evidenced by the fact that the group had rescued four orangutans. Similar complaints were filed by other NGOs to raise concerns over orangutan habitat conversion by its subsidiaries PT Nabatindo Karya Utama (NKU) and PT Andalan Sukses Makmur (ASMR) in Central Kalimantan. On the complaint concerning PT LSM the RSPO Complaints Panel found that the company had been clearing land before completing its High Conservation Value (HCV) assessment. The Complaints Panel also noted parallels with the complaint against PT NKU. This made the RSPO Complaints Panel state that the practices of Bumitama might be “systemic in nature.”23 In its response to the CRR draft-report Bumitama mentioned that an independent report24 has proven that in the case of PT NKU there has been no clearance of land before carrying out HCV-assessments. Recently, the group has said that it has set aside land for conservation and restoration purposes. In its annual report 2013 the company wrote: “Bumitama has more than 11,000 hectares of land under HCV area where rehabilitation plans and activities are on-going.”27 In its response of 4 September 2014 to the CRR draft-report Bumitama mentioned having about 12,500 ha of HCV area where remedial and reforestation programmes (where required) are being mapped out. In its response to the CRR draft-report Bumitama highlighted some recent deeds, often triggered by RSPO-complaints, with regard to the plight of orangutans. Three orangutans within the PT ASMR concession are monitored regularly. Late 2013, PT ASMR returned 809 ha of its concession back to the regional government for conservation by Tanjung Puting National Park (TNTP) as the area was identified as HCV as well as the feeding station for orangutans in the TNTP. On behalf of PT LSM a carrying capacity study was conducted by Universitas Tanjungpura and BKSDA West Kalimantan. This has led to the relocation of five orangutans in the period December 2013 – April 2014. Bumitama also stated that it will work together with the governmental BKSDA (Natural Resource Conservation Agency) and the Borneo Orangutan Survival Foundation (BOSF) in Central Kalimantan and BKSDA and IPB University in West Kalimantan on conservation of the biodiversity of HCV areas and mitigation of conflict programmes for orangutans and other wildlife. The company provides training to its patrol teams, to closely monitor the presence of orangutans in its land bank. Bumitama sees no significant future risk on the orangutan issue. With some 12,000 ha of potential orangutan habitat remaining within Bumitama Agri’s undeveloped land bank , the company’s adherence to its commitments is likely to strongly determine its ability to maintain its customer base, given rising sustainability requirements and the markets’ intense focus on Bumitama’s performance. Bumitama Agri is a member of the Roundtable on Sustainable Palm Oil (RSPO), which has adopted a Remediation and Compensation Procedure to allow companies that had previously cleared land without conducting High Conservation Value (HCV) assessments to qualify for certification through remediation and compensation. Chain Reaction Research has not assessed Bumitama Agri’s compensation obligations in detail but assuming recorded deforestation over the 2010-2013 period29 as an indicator, Bumitama Agri would have to provide compensation to the RSPO for an area of approximately 20,000 ha. A recent example is the HCV area deforested recently by Bumitama Agri’s subsidiary PT Ladang Sawit Mas, as shown on the left side of the satellite views of the concession area (Figure 6). The RSPO Compensation Procedure, which was adopted in April 2014, would require Bumitama to compensate for recent deforestation. CRR did not assess Bumitama’s “compensation debt” in detail. We estimate it may have to settle with RSPO an area of 20,000 hectares for forest cleared for the period 2010-2012 alone. Bearing in mind the forest types cleared, we estimate the compensation at USD 30 million in cash value. Compensation may also be settled in kind in situ or ex situ. On 12 September 2014 Bumitama announced that for five plantation subsidiaries it will set aside an additional area of 8,500 ha High Carbon Stock land (this figure includes peat areas).30 Such extra conservation set-asides represent an alternative to cash allocation to compensate for land clearing without prior HCV assessments. At present, the compensation requirements of the RSPO are separate from the compensation requirements Bumitama may face under Government Regulation 60/2012 (section 2.4.1). For more information on Bumitama and RSPO certification, please see section 2.7. The main impact on climate change from oil palm plantation companies concerns the development and drainage of peatlands. Bumitama Agri’s public policy, as laid out in its 2012 Prospectus is that the group does not cultivate oil palm trees on moderate to deep peat.31 Without specification of what defines depth, it cannot be assessed whether the group upheld its own policy. According to our analysis of concession maps, five out of Bumitama Agri’s 18 estate subsidiaries jointly opened up some 12,000 ha of peatland in Kalimantan.32 Some of this development involved peatlands of over two and three meters deep.33 Most of these peatlands are mapped as moderately deep. Indonesian regulations do not allow for development of peat more than 3 meters deep. Figure 7 shows a patch of land burning at close proximity of the estate office of Bumitama Agri’s subsidiary Ladang Sawit Mas in February 2014. The fire burned at close vicinity of an excavator presumed to be digging the land or Palm Oil Mill Effluent (POME) basins. This fire was just one of several burnt locations in this concession area, one of which was located even very close to the estate office complex. In its response to the CRR draft-report Bumitama has confirmed the fire in Figure 7 as a sporadic incident. According to Bumitama the fire occurred in an area of not more than 10 ha, and it was effectively extinguished in less than half a day. The company also stated it is a common practice for its plantation to have a watchtower and fire alert procedure, though it also stated to be in the midst of constructing a fire watchtower for PT LSM whilst land clearing already commenced some two years ago. The company also stated that it regularly conducts fire-fighting training with the inclusion of communities in all of its operations. The latest fire-fighting and awareness training was conducted in July 2014 in the PT ASMR and PT NKU area. In Indonesia, the management of the forestland estate falls under the statutory jurisdiction of the Ministry of Forestry. The Indonesian Forestry Act Nr. 41/1999 prohibits occupying forestland without prior permission of the Ministry of Forestry. Since decentralization was introduced in 1999-2001, the Ministry’s exclusive claim over the forestland estate has been challenged by local authorities who have issued hundreds of permits to oil palm plantation companies, overlapping with millions of ha of forestland. Government Regulation No. 60/2012 of 6 July 2012 attempts to address this problem, which was costing the state significant revenue.37 Plantation companies holding an oil palm license over forestland categorized as Production Forest (HP) and Limited Production Forest (HPT) were offered a one-time opportunity to apply for the acquisition of compensation land until 6 January 2013 in exchange for an amnesty for previous deforestation that had occurred without the required national permits. Based on the most recent Ministry of Forestry’s Land use Designation maps for West and Central Kalimantan, the concession areas of eight Bumitama Agri subsidiaries overlap with a total of 39,700 ha of forestland estate. However, according to CRR’s records, Bumitama submitted only four applications for amnesty under Government Regulation 60, covering some 32,400 ha of forestland estate (see Table 6).38 Bumitama, in its response to the CRR draft-report, did not go into details on the area of 32,400 ha. According to the recent land use designation maps, Bumitama had occupied 9,100 ha (7,300 ha after review by the company) of land without applying for amnesty for these lands under Government Regulation 60. As a result, CRR argued that the company is at risk of having this land revert to the state. It could also face violations of various forestry laws for illegal encroachment into forest reserves. Bumitama has responded to this issue in its review of CRR’s draft-report. On PT KMB (1,800 ha) the company claims that PT KMB is excluded from being a forestry area, based on Ministry of Forestry Regulation number 62/2013. According to the company, this regulation recognizes land rights obtained before the land is re-designated into forestry area. However, according to CRR’s records, the area was already designated forestland before Bumitama obtained its land rights. On PT WNA, Bumitama states that approximately 1,800 ha has been removed from PT WNA’s nucleus planted area, following the issuance of decision letter (SK) 529 in September 2012. The company did not respond explain another 1500 ha reported, so CRR has still marked this land as contested. On PT LGI and PT HPA the company stated that, to its best knowledge, there is no forestland within these concessions. CRR has rechecked its sources, and has continued to find forestland within these plantations. Government Regulation 60 (2012) requires the group to identify, acquire and restore uncontested land bank in Kalimantan as compensation for occupying land without the required permits. Assuming that Bumitama Agri’s applications for amnesty are processed and approved, the group would have to acquire and reforest 28,900 ha of land in the “Other Land Use” (APL) category in Kalimantan and return this land to the State. For 3,500 ha within the applications the company does not need to offer compensation land, as these are designated as “Convertible Production Forest” (HPK), which are eligible for development. In its response to the draft-report sent for review by CRR Bumitama stated that, with the exception of PT LSM, all the mining rights are held by Bumitama’s controlling shareholders (the Lim Hariyanto family). The 10,000 ha, cited to in its 2012 prospectus, refers to the areas that may have mineral, based on a rough estimate by the company. The area of PT LSM was not included in the prospectus, because the acquisition of PT LSM was after the listing of Bumitama. In the case of PT LSM the mining company is in discussion with Bumitama to compensate for non-mining, according to the response by Bumitama. Though clearing and planting began in 2004, the plantation has never been legal. Most of the concession area is located on Production Forest, a forestland category that cannot be legally occupied by oil palm companies unless its status is changed by the Ministry of Forestry. GMS never secured a forestland release permit over the land, and no environmental permit was ever issued by the provincial authorities either. Soon after Indonesia’s Spatial Planning Act No. 26/2008 came into force (whose provisions include civil servants’ personal liability for issuing permits that violate government spatial and land use planning), the Ketapang district head revised the company’s location permit. In June 2009, the concession area was scaled down from 18,300 ha to less than 3,000 ha.46 The area remaining within the location permit area would later be transferred to another plantation company, PT SSL, also managed by Bumitama Agri on behalf of third parties until mid-2014. The 4,300 ha cultivated in the former PT GMS concession area remained without location and environmental permits, but Bumitama Agri nonetheless commenced land development and FFB harvesting. Between 2011 and August 2013, Bumitama Agri cleared some additional 500 ha of land, including a nursery that is not even located within the old boundaries of PT GMS.47 In October 2013, the new Ketapang district head withdrew the company’s Plantation Business Permit (IUP)48, exposing Bumitama to further legal risk. Because of these actions, Bumitama Agri faces potential liability for harvesting palm fruit in violation of Indonesia’s Forestry Act, the Environmental Act and the Plantation Act. Recently, in December 2013, the cultivated area was rezoned as Other Land Use (APL) through Ministry of Forestry decision SK.936/Menhut-II/2013, which in principle enable the company to reapply for the necessary permits.49 However, it does not seem likely that the company will try to acquire these plantation and obtain permits to operate it, as on 7 August 2014 Bumitama terminated the GY Cooperation Agreement.50 Whilst contract termination may reduce the legal risk, the company could still be held liable for its past operations. Bumitama also recently cancelled its management contract with another company (PT Gunajaya Harapan Lestari) that was linked to the group’s senior directors. PT GHL operates on Pulau Bawal, a small island of the coast of Ketapang district. For the last two years, Bumitama Agri has not provided full transparency about the extent to which its operations are in line with Indonesian laws and regulations. In its prospectus from April 2012, the company made notice of expired Location Permits (Ijin Lokasi) for more than 110,000 ha of its land bank, and it described its progress towards obtaining a Right to Exploit (Hak Guna Usaha) for these areas. The company also made notice of having only a principle permit (Ijin Prinsip, the very first step in land acquisition) for 11,000 ha within its land bank.56 Since then, Bumitama Agri has not provided an update in its annual reports and/or through announcements to the Singapore Stock Exchange. After the publication of its prospectus in April 2012, Bumitama Agri acquired three large plantation subsidiaries: PT Ladang Sawit Mas (LSM), PT Andalan Sukses Makmur (ASMR) and PT Nabatindo Karya Utama (NKU).57 On ASMR and NKU information on permits could be found in the RSPO New Planting Procedures (NPP) for these companies. In these documents it could be found that for both areas Bumitama had obtained a Plantation Business Permit (Izin Usaha Perkebunan), but apparently not yet a Right to Exploit (Hak Guna Usaha).58 On PT LSM, Bumitama did not provide any information on the legal status, only the notion that the NPP for PT LSM is scheduled to be submitted in September 2014. Like many palm oil companies, Bumitama faces a number of disputes with local communities. As in other cases, a failure to resolve these disputes to the satisfaction of all parties could prevent Bumitama from developing its land, or face sanction by its customers, the Roundtable on Sustainable Palm Oil, or government authorities. In February 2014, members of the smallholders’ cooperative Harapan Abadi threatened to occupy 3,500 ha of land. Bumitama Agri’s subsidiary PT Windu Nabatindo Lestari (WNL) was accused of embezzling funds (IDR 7 billion) that should have been paid to the plasma farmers.59 In May 2014 the government of East Kotawaringin, Central Kalimantan, promised to resolve the dispute.60 Bumitama, in its response to the draft-report by CRR, denies that it has embezzled funds from the cooperative. According to the company, PT WNL has temporarily placed the incentive payment for one sub-cooperative under a special account, with the consent of the regional government. Other sub-cooperatives continue to receive the incentive payment from PT WNL. Bumitama states that it is waiting for the conclusive resolution of an on-going legal battle over alleged fraudulent act between a former chairman of a sub-unit of the cooperative and the members of the cooperative. CRR mentions that, in its response, Bumitama has not made explicitly clear why the members of the sub-cooperative have to bear the load of waiting for their incentive payment. On 10 May 2014, hundreds of farmers from three villages commenced blocking road access and reclaiming 3,000 ha of village land that was planted by Bumitama Agri’s subsidiary PT Bumitama Gunajaya Abadi (BGA) in Kotawaringin Lama sub-district, Central Kalimantan. According to media reports, their protest was triggered by frustrations that the company had not yet released smallholder lots to 1,500 families. Each family was supposed to receive two hectares each in early 2013, but at the time of the demonstration no clarification had been given why the transfer had not happened. Another motivation for the land reclaiming action is alleged backlog in payment of crop sharing revenue over the same period.61 The company has disputed the charges, and said that under the agreements made it has significant time to resolve these issues.62 In its response to the draft-report of CRR, Bumitama states that PT BGA has developed a smallholder scheme for five villages in the area and will continue to work with the other villages. According to the company, one village is objecting to the boundaries chosen and this boundary problem is influencing neighbouring villages. The local government is presently facilitating an agreement in this matter, according to Bumitama, while also stating that, once the consensus has been reached, PT BGA will extend the smallholder scheme to the other villages. In August 2013 a local community harvested 410 ha of planted oil palm within Bumitama Agri’s subsidiary PT Hatiprima Agro (HPA) alleging that the land belonged to the community and that the company’s permits were revoked.63 In its response to the draft-report of CRR, Bumitama states that PT HPA has been compensated for the land. However, it was discovered later that there were double claims over the possession of traditional land rights. This has created legal confusion over the rightful owner. The local government has been facilitating the dispute with the local businessman who also claims the land, and both parties are currently looking for a resolution on this issue, according to the company. While none of these issues are on their own likely to threaten Bumitama’s relationship with its customers, as a group the company would need to continuously demonstrate to its customers that it is sincerely working to comply with the “No Exploitation” provisions of their sourcing policies. In its response to the CRR draft-report, Bumitama mentions that its 23% is higher than the 20% required by the Indonesian regulation. However, in contrast to earlier regulations, a new regulation (Ministry of Agriculture Regulation Nr. 98/2013) obliges companies to develop smallholder lots (plasma) outside the company lease area (inti).66 It is not clear to what extent Bumitama Agri is living up with this new Indonesian regulation, which, as a matter of fact, has the potential to trigger forest encroachment and conflict with other local communities. Formation of an additional committee called the Conflict Resolution Committee. Bumitama also added that more than half of its board comprises of independent Directors. Furthermore, all interested person transactions must be covered by shareholder mandates, or must comply with an established procedure to ensure that interested person transactions are conducted on arms’ length basis and on normal commercial terms. The escalation of various contested land cases in 2013 have led the group’s management to strengthen its sustainability department with greater mandate, resources and human resources. Consequently, “stop work” orders issued by external parties (e.g. RSPO) and company management issued to various group subsidiaries appear to have been upheld from May 2014 onward whilst the extended sustainability team works to address the concerns for each subsidiary in order to resolve non-compliance with legal, voluntary and market standards. The group currently retains commitment to the RSPO Principles and Criteria, but commenced trials to explore the viability of adopting a ‘deforestation and peatland free’ policy. It is understood that the company intends to release a revised sustainability group policy by the end of 2014. Bumitama Agri’s subsidiary Bumitama Gunajaya Agro, under which most subsidiaries of Bumitama Agri reside, has been a member of the Roundtable for Sustainable Palm Oil (RSPO) since October 2007.71 Bumitama Agri as a single group was only registered as an RSPO member in November 2013.72 In its response to the CRR draft-report Bumitama highlighted this step as a “bold move”. Indeed the previous situation allowed for new subsidiaries to fall under an investment company that was no member of the RSPO. Now New Planting assessments have to made for every subsidiary that wants to plant oil palm, and new subsidiaries may be subject to RSPO-complaints, comments on New Planting Procedure documents, stop-work orders etc. In the last two years, civil society organizations filed no less than four RSPO complaints against Bumitama Agri.76 Initially, RSPO was slow to respond to the grievances and accepted company management commitments to halt land development in disputed areas. The company was later found to have broken these commitments.77 Presently, after many investigations, some establishments of conservation areas and a lot of engagement with stakeholders, the company is gradually getting out of the complaints zone. According to Bumitama’s response (dated 4 September 2014) on the CRR draft-report, the complaint on PT LSM is out of the Complaint Panel (now in the monitoring stage), the complaints on PT NKU and PT ASMR are earmarked to be out of the Complaints Panel in September/October 2014. The complaint on PT HPA is still in the Complaints Panel. In its annual report 2013, Bumitama Agri acknowledged “the compliance gap identified due to some complaints directed at our new acquisitions with regard to the RSPO New Planting procedures.”81 In April 2014, the company management issued an instruction to halt land clearing in Karya Makmur Langgeng, and commissioned studies to identify non-contested land that can be developed. As becomes apparent from Table 7, Bumitama Agri still faces a considerable challenge to ensure that all estate subsidiaries within the group are on track with RSPO certification. And unfortunately, RSPO certification is not a watertight guarantee that land contestation is duly addressed. Upon the closing of the revision of its Principles and Criteria early 2013, the RSPO membership had failed to agree on tighter rules to put an end to deforestation and peatland development. Furthermore, many HCV studies conducted by RSPO accredited assessors have been criticized for lacking credibility, partially because RSPO’s procedures do not stipulate at what point an HCV map cannot be subjected to further adjustment. In the case of Bumitama Agri’s subsidiary Ladang Sawit Mas, these weaknesses came at great expense to the company as its assessor produced no less than three different versions of the HCV map for the concession area, adjusting the map for previously identified HCV sites that had been cleared in the meantime (see Figure 8). While such practices by HCV assessors result in a larger acreage of productive land bank, they represent significant reputational risk to the company as stakeholders may insist that cleared sites previously identified as HCV are restored or compensated for. As a result of RSPO’s failure to zero-out its members’ exposure to public concerns over deforestation and climate change, 2013 has seen a strong proliferation of palm oil purchasing policies in the market place that set tighter standards that their suppliers must adhere to. Starting with Golden Agri-Resources’ Forest Conservation Policy (FCP) of February 2011, such policies are no longer exclusively adopted by retailers and manufacturers in final consumer markets. In December 2013, Wilmar International adopted its ambitious “No Deforestation, No Peatland, No Exploitation” policy that applies not only to the group’s own estates, but also to all its Third Party Suppliers.82 In February 2014, Golden Agri-Resources announced its intention to apply its FCP to its Third Party Suppliers as well.83 GAR has focused a significant portion of its third party compliance efforts on Bumitama. As Bumitama Agri is highly dependent on these two customers (see Table 5), the company is exposed to significant risk of losing one or both of its most important buyers if it is found to continue clearing of mature and maturing tropical forests and peatlands. In response, Bumitama Agri currently works on a strategy to first ensure full compliance with RSPO’s policies, and trialling more restrictive approaches in a pilot site where land clearing was previously scheduled to be completed in the course of 2014-15. Contested land is defined by CRR as planted and plantable acreage where the plantation company may not be able to retain or develop land because of a variety of factors, including legal prohibitions on land development, voluntary conservation commitments by the company, its customers, or investors, overlapping concessions, or community claims on land. Since it engaged in the palm oil industry in 1998, Bumitama has accumulated a land bank that has been increasingly exposed to dispute. Contestation over land and sustainability often remains hidden to the analyst community but are often brought out in the open by civil society organizations. In many respects, 2013 was the group’s “wake up call” when it became the target of campaigns by a wide array of NGO campaigns, making Bumitama a greater target for NGO campaigns than any other palm oil producer without major trading operations. In addition to government investigations and litigations related to land, Bumitama had to answer to several formal RSPO complaints filed by its stakeholders and was confronted with new “No Deforestation” requirements from its main customer, Wilmar (followed soon thereafter in 2014 by similar requirements imposed by GAR). Bumitama’s management struggled to effectively respond to these pressures. Management initially attempted to address concerns case by case, and ultimately decided to register the whole company group as a full member of RSPO. Chain Reaction Research’s methodology aims to quantify contested land at group level by identifying land that is subject to actual and/or potential contestation. The analysis is conducted at estate level and extrapolated to the company group. In the case of Bumitama, CRR assessed 16 out of the group’s currently held 18 plantation companies, all in West and Central Kalimantan. Plantation companies in which Bumitama holds a minority stake and companies managed on behalf of third parties were not included in the calculations, but were considered in the qualitative analysis. Adjustments were made to previous assessments, based on new developments and the company’s comments to a final draft of the Sustainability Risk Assessment. 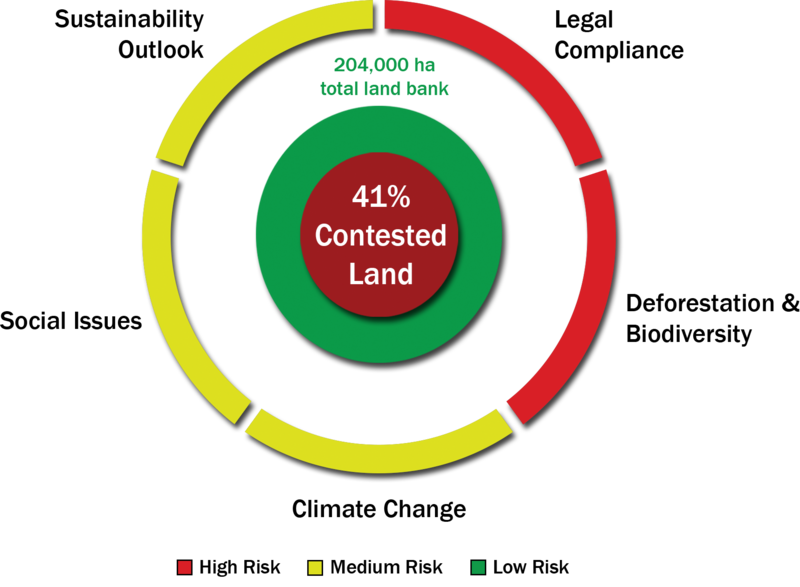 Based on CRR’s analysis of the subsidiaries studied, 41% of Bumitama’s land bank remains contested; a near equal portion (46%) is not contested but also not yet certified as sustainable. The group succeeded in obtaining its first two full RSPO-certifications for two CPO-mills and its corporate supply base, but not yet its smallholder supply (see section 2.8). IOI, through its subsidiary IOI Loders Croklaan, is one of the leading palm oil processors and sellers in Europe and North America. Although IOI Loders Croklaan reports that it does not directly source palm oil for Western markets from Bumitama, consumer companies are increasingly scrutinizing the activities of their suppliers whole business operations, regardless of where a particular physical commodity is sourced from. As a result, IOI Loders Croklaan is particularly exposed to risk that major consumer companies in developed countries will cut off purchases of palm oil due to the parent company’s involvement in Bumitama. In addition, environmental performance at IOI’s joint ventures with Bumitama has recently had more serious issues than even Bumitama’s own land, and faced even more scrutiny. For instance, on the IOI/Bumitama joint venture Bumi Sawit Sejahtera (BSS) has 1,047 hectares of peatlands, nearly 711 hectares of which are protected under Indonesian law.89 Though IOI committed to stop conversion on these lands, remote sensing and field visits in 2014 show recent deforestation on peat and in orangutan habitat. IOI Loders Croklaan has additional sustainability risk issues in other parts of its operations, but its partial ownership of Bumitama and the major issues on its joint venture operations significantly increase its own risk of losing market access and investors. Key income indicators for Bumitama Agri in 2012 and 2013 are provided in Table 9. Bumitama Agri’s revenues increased from USD 376.0 million in 2012 to USD 392.2 million in 2013. This increase is primarily due to a higher CPO production volume (13.1% up in comparison to 2012). Volume growth was higher than the growth of revenues, though, as CPO and palm kernel prices dropped and the Indonesian rupiah depreciated against the US dollar. EBITDA increased 3.4%. Net income (net profit attributable to shareholders) showed a 8.6% growth in rupiahs, but dropped 1.7% in US dollars. Profits are influenced negatively by the company’s dependence on FFB sourced from external suppliers. Of the total FFB volumes processed by Bumitama Agri in 2013, 23% was sourced from (plasma) smallholders and 28% from other external suppliers – together accounting for 63% of total FFB sourcing costs.90 Table 10 provides an overview of the cost structure of Bumitama Agri in the past two years. FFB sourcing costs account for the largest share of total costs due to the high costs of fertilising and harvesting. For Bumitama Agri, FFB sourcing costs accounting for 83-85% of total costs, as shown in Table 10. When a larger part of Bumitama Agri’s own plantations reaches maturity in the coming years, its procurement of – more expensive – FFB from external suppliers might go down. But at the same time Bumitama Agri is increasing its FFB processing capacity to 4.0 million tonnes in 2014, while it only produced 1.6 million tons itself in 2013. The result of both developments might be that external FFB procurement stays more or less at the same level. However, Bumitama Agri’s high dependence on external FFB suppliers does have the advantage that a large share of its production costs is variable. Given that palm oil companies are price takers and depend on commodity market prices, it is common practice that contracts with external FFB suppliers (accounting for 28% of all FFB processed by Bumitama Agri) are flexible and can be adjusted to demand. Table 11 gives an overview of the development of Bumitama Agri’s market capitalization and the main balance sheet categories in the past two years. Bumitama Agri’s market capitalization decreased by 13.8% from 2012 to 2013, because the company’s share price is highly correlated with the share prices of other oil palm companies and with CPO price developments. As of July 2014, market capitalization has recovered to USD 1,783 million, supported by the recovery of spot commodity palm oil prices. Shareholders and banks are the most important financial stakeholders of Bumitama Agri, financing 48% respectively 35% of its total equity plus liabilities. Table 13 presents an overview of the banks that provided loans to Bumitama Agri in the past five years and underwrote its IPO in April 2012. In early 2014, Bumitama Agri launched an Islamic Medium term notes program in Malaysia, with a total size of MYR 2 billion (USD 602.9 million). The Islamic notes received a rating of AA3 with stable outlook from RAM Ratings Services Bhd.94 Net proceeds raised will be used for capital expenditures, working capital, investments, refinancing of existing debt and general corporate purposes. The first issuance with a value of MYR 500 million (USD 150.7 million) was completed in March 2014, with a tenure of five years and an interest rate of 5.25%. Even though Bumitama Agri’s profitability ratios have decreased over the past three years, they remain strong. Especially the Return on Equity (15.2%) and the Net income margin (21.1%) are high. The decrease of profitability ratios can be explained by weaker CPO prices observed for the same period. Table 15 provides an overview of the leverage and coverage ratios of Bumitama Agri in the past three years. Development of the liquidity ratios (current and quick ratios) show that the company has an adequate management of working capital and is able to pay short term obligations. Interest coverage (or EBIT to interest) has increased and remains healthy at 6.9, which is positive for creditors. Although Bumitama Agri had 60% more bank loans on its balance sheet in 2013, the increase in leverage has been moderate: the debt ratio stands at a modest 0.5, while the debt-equity ratio is still only 0.9. This means the company is financed conservatively and has a sound credit profile. Table 16 provides an overview of the valuation ratios of the Bumitama Agri share in the past two years. Its valuation ratios have substantially increased for the company, despite weaker CPO prices in the past two years, with a Price / Earnings ratio of 22.1 and an Enterprise Value / EBIT ratio of 17.0. Table 17 compares some profitability and valuation ratios of Bumitama Agri with those of other major palm oil companies. Compared to the market capitalization of other palm oil companies included in Table 17, Bumitama Agri is relatively small. However, Bumitama Agri’s net profit margin is the highest among its peers (20.3%). It also offers relatively high returns on assets (8.2%) and on equity (16.3%). Valuation ratios show a mixed picture: its Price / Earnings ratio of 19.9 is cheap in comparison to its peers, but the Price to Sales ratio (4.0) is relatively high. This can be explained by the perceived attractiveness of the young maturity profile of Bumitama Agri’s plantations which means that yields and production volumes are expected to go up in the medium-long term. This section discusses the financial risks of five possible scenarios that could be created by the sustainability risks identified previously in section 2. For this assessment, we developed a financial model based on Bumitama’s most recent financial statements and Bloomberg estimates on future earnings. Using this model we assess a baseline scenario in which sustainability issues have no impact, and five alternate scenarios that evaluate the impact of the sustainability issues outlined in this report. We analyse the impacts of each scenario on key financial indicators such as ROE, ROA, leverage and profit margins. Bumitama Agri faces difficulties to (re)finance debt. For comparative purposes, each of these scenarios is assumed to occur at the beginning of 2015. To assess the financial impacts of these scenarios in 2015 and 2016, they are compared with the baseline scenario. Section 4.2 provides an overview of the baseline scenario and the assumptions used, while the following sections give an overview of the five alternative scenarios. The below table gives an overview of Bumitama Agri’s main financial indicators for 2012 and 2013, as well as the estimated development of these indicators in the period 2014-2016. These estimates are based largely on analyst consensus estimates as published by Bloomberg, with some additional estimates from our side. The baseline scenario assumes a business-as-usual development for Bumitama Agri, in which the sustainability issues as discussed in section 2 do not have a significant impact on its financial results. Long term debt increases with US$ 50 million each year (Islamic bonds – loan repayments). Based on these assumptions and Bloomberg estimates, the below table shows the baseline scenario for Bumitama Agri’s key financial indicators in the period 2012-2016. These results show that in the baseline scenario both the revenues and the net income (profit attributable to the company’s shareholders) show a clear rising trend. The net income margin stays fairly constant at a high level of 20-22%. Return on Assets also stays constant, at around 8-9%, while Return on Equity gradually improves, to 18.2% in 2016. The leverage (debt-equity ratio), which showed some increase in 2013, will drop after that to a very healthy 0.79% in 2016. However, Bumitama Agri’s positive financial development in the baseline scenario is assumed without considering the potential financial impacts of sustainability risks. The following sections will describe five alternative scenarios, indicating how Bumitama Agri’s financial indicators might be impacted by the sustainability issues described in section 2. As discussed earlier, Bumitama Agri is at risk of losing its two major customers, Wilmar International and Golden Agri-Resources, because of violations of those companies’ “No Deforestation, No Peat, No Exploitation” forest conservation policies.95 Given Wilmar and GAR’s efforts to only source responsible palm oil, the policies of major consumer companies (like Kellogg, Mars, Johnson & Johnson and many others), increased investor attention to sustainability issues, and public opinion following Wilmar International’s action, it is reasonable to anticipate that Wilmar and/or GAR would at some point decide to stop purchases from Bumitama Agri if the company does not rapidly and fully address the sustainability issues outlined. This scenario looks only at the potential impact of Wilmar suspending purchases as an illustrative case. However, GAR has been equally involved in working to secure improvements from Bumitama, and equally exposed to customer and NGO pressure on the issue, and we believe that if Wilmar were to suspend purchases, it is highly likely that GAR would as well, magnifying the impacts detailed below. Option 1b: If Bumitama Agri would not be able or willing to cancel contracts with its external palm fruit (Fresh Fruit Bunch or FFB) suppliers, this would probably mean that the company would have to leave some of its own FFB unharvested at the trees. This is a common practice among palm oil companies. Costs of cleaning and disposal not-harvested FFB are similar to costs of harvesting. Typically, inventory capacity of crude palm oil is around one month of production, which prohibits extensive storage of Crude Palm Oil. Table 19 gives an estimate for the development of Bumitama Agri’s key financial indicators in the period 2012-2016 for both options. As Table 19 shows, revenues would drop significantly if Wilmar International cancels its purchasing contracts by January 1, 2015, with net income declining from 90.7 million to negative territory, a loss of $105.4 million. We anticipate that Bumitama would be able to make up for some of the lost market in 2016, but net income would still lag USD 64 million behind projected FY 2014 levels. These scenarios account for Bumitama Agri’s ability to adjust to reduced demand by cancelling its supply contracts with external palm suppliers. Other operating expenses would be less variable, but would nevertheless decrease somewhat as well. Financing and depreciation costs would stay fixed. Overall, the company would incur a net loss of USD 14.9 million in 2015, recovering to a small, but positive, net income of USD 26.0 million in 2016. As a consequence the net income margin would be negative in 2015 and only 7.7% in 2016. Return on Assets (RoA) and Return on Equity (ROE) would also drop significantly. Both dividends and retained earnings would drop and the stock value of the company would be readjusted. As equity growth would not keep face with increase of debt, the debt-equity ratio (leverage) would increase as well to 1.19 in 2016. In option 1b Bumitama Agri would not be able to cancel its supply contracts with third-party suppliers. Table 20 shows that this scenario would have a major impact on the company’s profitability. Revenues would drop similarly to the first option (Table 19), but as costs can hardly be reduced the net income would drop to USD -/-77.8 million in 2015 and USD -/-48.3 million in 2016. The net income margin would therefore be negative in both years. RoA and RoE would also be clearly negative. This, together with lower net cash flows available for dividends, would have a major impact on the stock value of the company. This would also affect interest coverage, therefore the credit profile of the company would change. While the debt-equity ratio (leverage) increases to 1.57 in 2016, the cost of debt is expected to increase as well. In both options, the loss of Wilmar International as a customer would have an impact on net income, ROE, ROA and leverage. Only if the company has the flexibility to cancel purchasing contracts would it return to profitability in 2016. Especially when this flexibility is lacking, the company’s share price would drop given the lower expected cash-flows in the mid-term. Due to lower cash flows to service debt, the interest coverage would be correspondingly reduced. Creditors would therefore want to be compensated with a higher risk premium, which would result in a higher cost of capital for Bumitama Agri. If Golden Agri-Resources, Bumitama Agri’s second-largest customer, and other buyers would follow in Wilmar’s footsteps, these steps would further reduce the company’s income. We believe it is highly likely that GAR would cease purchases from Bumitama if Wilmar did as well, because the two companies face similar pressures from stakeholders on this issue, and it is difficult for one to continue purchases where the other has discontinued them. As described in section 2.4.1, Bumitama Agri has applied for the legalisation of up to 28,900 hectares of oil palm plantations, which were developed without forestland release permits. Government Regulation No. 60/2012 requires the company to acquire and reforest an equivalent area to legalize its occupation of these forestland categories. In this scenario, the costs of acquiring and reforesting compensation land to be handed over to the government are estimated at USD 3,000 per hectare. These compensation costs are modelled as an one-off extraordinary loss of USD 86.7 million. The extraordinary loss of USD 86.7 million is partially compensated by a reduction in taxes and a reduction in the profit attributable to minority shareholders, resulting in a drop of the net income with USD 58.8 million in 2015, compared to the baseline scenario. Table 21 shows that Bumitama Agri’s profitability and margins would be affected when forestland compensation costs have to be paid. Because of this one-off event the company would generate a lower – but still positive – net income in 2015, while return on assets and return on equity would also show a temporary drop. Table 22 shows that Bumitama Agri’s profitability and margins would be affected in 2015 when RSPO compensation costs have to be paid. Because of this one-off event the company would generate a lower net income in 2015, while return on assets and return on equity would also show a temporary drop. According to Indonesian Government Regulation No. 60/2012 of 6 July 2012, any remaining forestland within the concessions that had not been developed as of 6 July 2012 is not eligible for compensation and would revert back to the State. As described in section 2.4.1, Bumitama Agri could lose access to a land bank estimated at 7,300 ha based on this regulation. Other losses of land bank could be due to permit issues (such as the loss of the entire 7,100 ha land bank of PT Hatiprima Agro), overlaps with mining concessions and land disputes with communities. With the scenario described in this section we aim to estimate the impact on Bumitama Agri’s financial indicators if the company would lose 10,000 ha of its plantation areas. This would have an impact on its production volumes and revenues. In addition, the biological assets included on the balance sheet would be impaired, in accordance with International Accounting Standard (IAS) 41.99 Such impairment would be reflected in the company’s income statement as an extraordinary loss. Finally, the company would to have to incur extra costs to acquire additional land banks and develop these into plantations. Impairment of the biological assets lost is based on the proportional loss of hectares and is registered as an extraordinary loss in the income statement. The impacts of losing a planted land bank of 10,000 hectares as of January 1, 2015 for the financial indicators of Bumitama Agri are estimated in Table 23. As displayed in Table 23, this scenario shows that due to the production volume lost, sales would drop with around 6% in comparison to the baseline scenario. Net income would drop to USD 27.8 million in comparison to USD 109.7 million in the baseline scenario. The losses are primarily due to the extraordinary costs of acquiring and preparing new land banks and the proportional impairment of biological assets. As a result, the net income margin in 2015 (5.5%) is considerably lower than the 20-22% in the baseline scenario, recovering partially to 13.8% in 2016. Returns on Assets and Return on Equity would also drop, affecting cash flows and the value of the company. The debt-equity ratio (leverage) increases in 2016, from 0.79 in the baseline scenario to 1.03 in this scenario. Furthermore, the loss of biological assets could also have on impact on the assets pledged to creditors. This could mean that the banks would demand additional securities, which could create challenges for Bumitama if these are not immediately available. As the financial consequences of a more tight availability of capital for Bumitama are too uncertain to quantify, this scenario has not been modelled further in this report. As Bumitama Agri is a dedicated upstream company which is largely dependent on only two CPO buyers, poor management of sustainability and governance issues at its plantations could potentially have significant negative financial implications. Failure to address these issues could lead to a loss of both of its major customers, significant liabilities for compensation and remediation, a potential loss of biological assets, as well as higher costs of capital. In this section the potential impacts on Bumitama’s key financial indicators for 2015 and 2016 are assessed in comparison to a baseline scenario, based on analyst consensus. As shown in Table 24, in all scenarios Bumitama’s key financial indicators – Net income margin, RoA, RoE – are depressed in comparison to the baseline scenario, while the Debt-equity ratio increases. The table shows that the strongest impact could be anticipated from the potential loss of Bumitama’s landbank and the loss of its primary customer Wilmar International. In this last scenario, Bumitama’s revenues would strongly go down and its net income would turn negative in 2015, and possibly in 2016 as well. The exact impact would depend predominantly on Bumitama’s options to reduce FFB procurement from external suppliers and to find other customers quickly. There is a possibility that these different scenarios could occur simultaneously, creating cumulative and more serious impacts on financial indicators. Additionally, a significant risk embedded in all scenarios is that they could result in further serious damage to the reputation of Bumitama Agri among customers, investors, and the public. This could trigger additional scenarios with negative consequences on the financial indicators of the company, such as major customers cancelling purchasing contracts and banks and investors denying financing and investments. CRR’s financial scenario analyses therefore underline that addressing current and past sustainability issues will be directly relevant for Bumitama Agri’s future financial health. Bumitama Agri has told its customers and other stakeholders that it is moving aggressively to address many of these issues. For instance, it has said that it has conducted an assessment of its High Carbon Stock forests, and pledged not to engage in future deforestation. However, it has not provided these assessments, nor announced a forest conservation policy that would put it in line with its customers’ requirements. It also has not made clear how it will remediate past deforestation and legal liability issues. The extent to which Bumitama is able to successfully resolve these issues will significantly affect its financial performance – as well as the performance of its part-owner IOI Corporation – through at least 2016, and likely beyond. This report was authored by Jan Willem van Gelder, Glenn Hurowitz, Cecilia Springer, Angeles Toledo, and Joel Finkelstein. Bumitama Agri Ltd. “Annual Report 2013.” 2014. Available at: http://ir.bumitama-agri.com/annuals.cfm. Bumitama Agri Ltd. “Annual Report 2013.” 2014: p. 8. Available at: http://ir.bumitama-agri.com/annuals.cfm. Bumitama Agri Ltd. “Full Year & Fourth Quarter 2013 Presentation.” 28 February 2014. Available at: http://bit.ly/1oFqOzY. Bumitama Agri Ltd. “Annual Report 2013.” 2014. Available at: http://ir.bumitama-agri.com/annuals.cfm; Bumitama Agri Ltd. “Full Year & Fourth Quarter 2013 Presentation.” 28 February 2014. Available at: http://bit.ly/1oFqOzY. Bumitama Agri Ltd. “Annual Report 2013.” 2014: p.5. Available at: http://ir.bumitama-agri.com/annuals.cfm. Bumitama Agri Ltd. “Prospectus Dated 3 April 2012 (Registered by the Monetary Authority of Singapore on 3 April 2012).” 3 April 2012: p. 149. Available at: http://bit.ly/1eeYHC6. Astra Agro Lestari, “Annual Report 2013”. 2014: p. 7. SMART, “Annual Report 2013”. 2014: p. 11. Bumitama Agri Ltd. “Annual Report 2013.” 2014: p. 128. Available at: http://ir.bumitama-agri.com/annuals.cfm. Bumitama Agri Ltd. “Annual Report 2012.” 2013. Available at: http://ir.bumitama-agri.com/annuals.cfm. Harita Group. “Welcome to Harita Intranet Portal.” 2013. Available at: http://bit.ly/1nXyVLh; PT Cita Mineral Investindo Tbk. “Company Profile.” 2010. Available at: http://bit.ly/RgpAAO. The company has a 30% stake in a joint venture constructing a USD 1 billion alumina smelter in Ketapang. Sources: “USD 1 billion alumina smelter in West Kalimantan kicks off.” Jakarta Globe 20 July 2013. Available at: http://bit.ly/1oiLkH3; PT Cita Mineral Investindo Tbk. “Annual Report 2013.” 2013: p. 36. Available at: http://bit.ly/RkluHw; Retno Ayuningtias. “Harita to Build $320m Nickel Smelter.” Jakarta Globe 19 November 2013. Available at: http://bit.ly/1nXBbCq. Companies: PT Roda Mas Timber Kalimantan; PT Tirta Mahakam Resources Tbk; PT Kemakmuran Berkah Timber. Sources: PT Tirta Mahakam Resources Tbk. “Annual Report 2012.” 2012: p. 47. Available at: http://bit.ly/Srje2y; PT Tirta Mahakam Resources Tbk. “Shareholding Structure.” 2014. Available at: http://bit.ly/1nWnFgy. IOI Group. “Annual report year ending 30 June 2013.” 27 September 2013: p. 296. Available at: http://bit.ly/Q3BYmL. IOI group. “Dato’ Lee Yeow Chor appointed Chief Executive Officer of IOI Corporation Bhd and Mr Lee Yeow Seng appointed Chief Executive Officer of IOI Properties Group Berhad.” 8 January 2014. Available at: http://bit.ly/1g6oBJ0. The ESG standards referred to, as well as the research methods used to assess the company’s compliance, are described in a separate document on the Risk Assessment Framework of Chain Reaction Research, available on the CRR website. Comparison of OU habitat maps with Landsat. Sources OU habitat: UNEP World Conservation Monitoring Centre, “World Atlas of Great Apes and their Conservation”, http://bit.ly/1lbGEQ2, 2005. Comparison of OU habitat maps with Landsat 2013. Aidenvironment. “Verification of Greenpeace’s ‘Burning Up Borneo’ report.” Publication for Unilever. November 2009: p. 103. Available at: http://bit.ly/1pqdvWS. Bumitama Agri Ltd. “Annual Report 2012.” 2013: p. 33. Available at: http://ir.bumitama-agri.com/annuals.cfm. Roundtable on Sustainable Palm Oil Complaints Panel. “RE: Complaint – PT Ladang Sawit Mas.” 1 July 2013. Available at: http://bit.ly/1otbxXb. Aksenta, “Review and Verification of PT Nabantindo Karya Utama of the Bumitama Agri Ltd. Compliance with the RSPO Principle 5 – High Conservation Value (HCV) and Principle 7 – New Planting Procedure (NPP), executive summary”, 7 February 2014. Available at: http://bit.ly/1uGVZy4. Bumitama Agri Ltd. “Bumitama Agri’s RSPO Journey Update.” 10 February 2014. Available at: http://bit.ly/1vDdcuB. Aidenvironment, “Valuation of Bumitama Agri’s compliance to its own public statements and to RSPO”. 12 February 2014. Available at: http://bit.ly/1j99baC; Friends of the Earth Europe, US and Netherlands. “Bumitama Agri’s diary of destruction.” 25 March 2014. Available at: http://bit.ly/1egfqoG. Bumitama Agri Ltd. “Annual Report 2013”. 2014: p. 25. Available at: http://ir.bumitama-agri.com/annuals.cfm. Bumitama Agri Ltd., announcement before Singapore stock exchange “Bumitama Pilots High Carbon Stock Assessment”, 12 September 2014. Available at: http://bit.ly/1p1zf8q. Bumitama Agri Ltd. “Prospectus Dated 3 April 2012 (Registered by the Monetary Authority of Singapore on 3 April 2012).” 3 April 2012: p. 144. Available at: http://bit.ly/1eeYHC6. Comparison of peatland map with Landsat 2013. Source peatland map: Wetlands International – Indonesia Programme & Wildlife Habitat Canada (WHC). “Map of Peatland Distribution Area and Carbon Content in Kalimantan, 2000 – 2002.” 2004. Available at: http://bit.ly/1hc6CSo; Regional Physical Planning Program for Transmigration (RePPProT), 1990. For Central Kalimantan, source: Aidenvironment. “Verification of Greenpeace’s ‘Burning Up Borneo’ report.” Publication for Unilever. November 2009. Available at: http://bit.ly/1pqdvWS. For West Kalimantan, the April 2014 HCV map shows several localities of peat over three meters in depth, whilst satellite imagery demonstrates that these peatlands had mostly been cleared and planted. Bumitama Agri Ltd. “Environment.” 2014. Available at: http://bit.ly/1hnSrOk. In 2009, sub-standard fire prevention systems were also identified in Bumitama Agri estates in Central Kalimantan. Source: Aidenvironment. “Verification of Greenpeace’s ‘Burning Up Borneo’ report.” Publication for Unilever. November 2009. Available at: http://bit.ly/1pqdvWS. Presiden Republik Indonesia. “Regulation 60/2012, amendment of No. 10 of 2010, procedures for change to the allocation and function of forestlands.” 6 July 2012. Available at: http://bit.ly/1mYAiWI;Aidenvironment. “State revenue losses caused by unauthorized oil palm plantation expansion in the forestlands of West and Central Kalimantan in 2005-2011.” May 2013. Unpublished report for the ClimateWorks Foundation – Climate and Land Use Alliance (CLUA). The Ministry of Forestry, Republic of Indonesia. “Application for forest release permit with regard to PP 60/2012.” 4 October 2013. Available at: http://bit.ly/1mIFZb0. Mining Concession permits from Badan Informasi Geospasial (BIG). Bumitama Agri Ltd. “Prospectus Dated 3 April 2012 (Registered by the Monetary Authority of Singapore on 3 April 2012).” 3 April 2012: p. 131. Available at: http://bit.ly/1eeYHC6. Bumitama Agri Ltd. “About us.” 2014. Available at: http://bit.ly/1rWG1lk. “Adaro pays $60m to resolve Astra dispute.” Jakarta Post 3 September 2008. Available at: http://bit.ly/1fzDQzT. V.S. Industry Berhad. “Disposal of PT. GY Plantation Indonesia, a 53% Owned Subsidiary Company of V.S. Holdings (M) Ltd.” 19 July 2011. Available at: http://bit.ly/1nDvEyB; V.S. Industry Berhad. “(completion) Disposal of PT. GY Plantation Indonesia, a 53% Owned Subsidiary Company of V.S. Holdings (M) Ltd.” 1 November 2011. Available at: http://bit.ly/V4riYk. Bumitama Agri Ltd. “Prospectus Dated 3 April 2012 (Registered by the Monetary Authority of Singapore on 3 April 2012).” 3 April 2012: p. 134. Available at: http://bit.ly/1eeYHC6. Bumitama Agri Ltd. “Unaudited Financial Statements for the First Quarter (“1 Q”) Ended 31 March 2014.” 9 May 2014. Available at: http://bit.ly/1nvIgq3. Jaya Pos. “PT GYPI Diduga Sarat KKN, Menhut Putihkan 5000 Ha Sawit Ilegal Milik PT BGA Group Ketapang.” 10 June 2014. Available at: http://bit.ly/T2moca. Friends of the Earth United States, WALHI (Friends of the Earth Indonesia), SumOfUs, and Forest Heroes. “Commodity Crimes: Illicit land grabs, illegal palm oil, and endangered orang-utans.” November 2013. Available at: http://bit.ly/1dQUZnz. Bumitama Agri Ltd. “Termination of GY cooperation agreement and GHL cooperation agreement”, http://bit.ly/1nYC2h0, 7 August 2014. Save Our Borneo. “PT. Hati Prima Agro clears land illegally.” 28 May 2012. Available at: http://yhoo.it/1j3ftuQ. Bumitama Agri Ltd. “Bumitama-HPA Announcement of Notice of Appeal”, http://bit.ly/1mTl4kL, 7 August 2014. Mongabay, “Palm oil company continues to operate illegal plantation despite court ruling”, 12 September 2014, http://bit.ly/1pjszBG. Roundtable on Sustainable Palm Oil. “RE: complaint on PT Hati Prima Agro/Bumitama Gunajaya Agro.” 13 December 2012. Available at: http://bit.ly/1jwDhWQ. Comparison of OU habitat maps with Landsat 2013. Sources: Caldecott, Julian, and Lera Miles, eds. World Atlas of Great Apes and their Conservation. Berkeley, CA: University of California Press, 2005. Available at: http://bit.ly/1lbGEQ2. Singleton, Ian et al. “Orangutan Population and Habitat Viability Assessment: Final Report.” IUCN/SSC Conservation Breeding Specialist Group. 2004. Available at: http://bit.ly/1nhhaYt. Bumitama Agri Ltd. “Prospectus Dated 3 April 2012 (Registered by the Monetary Authority of Singapore on 3 April 2012).” 3 April 2012: p. 45, 49, and 154-156. Available at: http://bit.ly/1eeYHC6. Bumitama Agri Ltd. “Acquisition of a Subsidiary.” 26 April 2012. Available at: http://bit.ly/1uu39r6; Bumitama Agri Ltd. “Annual Report 2013.” 2014: p. 96. Available at: http://ir.bumitama-agri.com/annuals.cfm. RSPO, “NPP Notification Andalan Sukses Makmur (ASMR).” 6 February 2014. Available at: http://bit.ly/1uH24ea. Antara Kalteng. “WNL Diduga Gelapkan Uang Ratusan Petani Plasma.” 26 February 2014. Available at: http://bit.ly/1ixk21a. “Pemkab Segera Selesaikan Sengketa Plasma Sawit.” Ciputra News 14 May 2014. Available at: http://bit.ly/1lJuhyt. Suputar Kalteng. “Ratusan Warga 3 Desa Duduki Kantor BGA.” 16 May 2014. Available at: http://bit.ly/1yACZVw. “Sisa Plasma Akan Direalisasikan November 2014.” Radar Sampit Online 17 May 2014. Available at: http://bit.ly/1jHxAC7. Supreme Court of the Republic of Indonesia, “Nomor: 419.” 29 January 2014. Available at: http://bit.ly/1pzQFfs. Annual reports for the year ending 31 December 2013. For Plantation Business Permits issued after February 2007 plantation companies are obliged to facilitate the development of community gardens OUTSIDE the permitted area for at least 20% (twenty percent) of the total permitted area. Source: Ministry of Agriculture. “Regulation 98/2013, guidelines for the licensing of plantations.” 30 September 2013. Available at: http://bit.ly/1oIKtAn. Bumitama Agri Ltd. “Annual Report 2013”. 2014: p. 47-48. Available at: http://ir.bumitama-agri.com/annuals.cfm. Roundtable on Sustainable Palm Oil. “Search for RSPO Member & Data.” 2014. Available at: http://bit.ly/1fTRWWW. Roundtable on Sustainable Palm Oil. “Letter from Bumitama Agri Ltd. on RSPO membership.” 20 November 2013. Available at: http://bit.ly/1gXYbgE. Bumitama Agri Ltd., “First Half 2014 (“6M2014”) Presentation”, http://bit.ly/1oCVx4U, 13 August 2014. Roundtable on Sustainable Palm Oil. “Principles and Criteria Assessment Progress, Bumitama Agri.” 2014. Available at: http://bit.ly/1pbEBlL. Roundtable on Sustainable Palm Oil. “Time bound plan RSPO certification of unit management’s BGA.” 9 December 2013. Available at: http://bit.ly/1imrQNu. The status of each of the complaints can be found respectively at: http://bit.ly/1lx38gM; http://bit.ly/PAYXW2; http://bit.ly/1fTW1um; http://bit.ly/1i9qdSL. Roundtable on Sustainable Palm Oil. “New Planting Procedure.” 2014. Available at: http://bit.ly/1ntvYPq. RSPO. “Re: New Planting Procedure PT Karya Makmur Langgeng (PT KML)”. 11 September 2014. Bumitama Agri Ltd. “Annual Report 2013”. 2014: p. 5. Available at: http://ir.bumitama-agri.com/annuals.cfm. Wilmar. “Wilmar International Announces Policy to Protect Forests and Communities.” 5 December 2013. Available at: http://bit.ly/IOviVF; Wilmar. “No Deforestation, No Peat, No Exploitation Policy.” 5 December 2013. Available at: http://bit.ly/1hDCOBB. Golden Agri-Resources. “Full Year 2013 Results Performance.” 28 February 2014: p. 15. Available at: http://bit.ly/1A5vOFG. SGS Qualipalm. “Sawit Nabati Agro Group New Plantings Report.” October 2010: p. 4. Available at: http://bit.ly/SmtWHd. The plantation of PT Ketapang Sawi Lestari no longer belongs to IOI. Source: IOI Group. “Estates and Mills.” 2014. http://bit.ly/1lPHVip. Bumitama Agri Ltd. “Prospectus Dated 3 April 2012 (Registered by the Monetary Authority of Singapore on 3 April 2012).” 3 April 2012: p. 80. Available at: http://bit.ly/1eeYHC6. Bumitama Agri Ltd. “Annual Report 2013”. 2014: p. 19. Available at: http://ir.bumitama-agri.com/annuals.cfm. Bumitama Agri Ltd. “Competitive Strengths.” 2014. Available at: http://bit.ly/1m8pHct. SGS Qualipalm (Evaluation 2010, September 27 – 2010, October 1). Report on Plantation Development Status Against RSPO NPP. Bumitama Agri Ltd. “Annual Report 2013”. 2014: p. 89. Available at: http://ir.bumitama-agri.com/annuals.cfm. Bumitama Agri Ltd. “Annual Report 2013”. 2014. Available at: http://ir.bumitama-agri.com/annuals.cfm. RAM Ratings. “RAM Ratings assigns AA3/Stable rating to Bumitama’s proposed sukuk programme.” 22 January 2014. Available at: http://www.ram.com.my/pressReleaseView.aspx?ID=58b7ec3a-a33b-46e4-b1b4-96e1a73dfc40#. Wilmar. “No Deforestation, No Peat, No Exploitation Policy.” 5 December 2013. Available at: http://bit.ly/1hDCOBB. Roundtable on Sustainable Palm Oil. “RSPO Remediation and Compensation Procedures Related to Land Clearance Without Prior HCV Assessment, final document for submission to EB.” 20 December 2013. RSPO Remediation and Compensation Working Group. RSPO Remediation and Compensation Procedures Related to Land Clearance Without Prior HCV Assessment. Final document for submission to EB, November 2013. CRR’s calculation is based on forest loss in Bumitama’s subsidiaries over the 2010-2012 period only, thus not all deforestation from November 2005 onward. Two other factors apply that were not incorporated in our estimate: whether the clearance took place in subsidiary that was connected to an RSPO member (in this case: BGA) and whether deforestation took place prior to the completion of High Conservation Value (HCV) studies. IFRS. “Recognition and Measurement of Biological Assets and Agricultural Produce in accordance with IAS 41.” 2007. Available at: http://bit.ly/1nsrgze. Calculations according to palm oil financial professionals. Lumina Ltd.
HSBC, “HSBC Statement on Forestry and Palm Oil”, http://bit.ly/1pmkORo, March 2014; HSBC, “HSBC Agricultural Commodities Policy”, http://bit.ly/1mumV3A, March 2014; HSBC, “HSBC Forestry Policy”, http://bit.ly/1eWpg5d, March 2014. Deutsche Bank AG, “Statement on our involvement with Bumitama Agri Group”, 31 March 2014. Available at http://bit.ly/1r1lUQI; Friends of the Earth International, “Deutsche Bank divests from Bumitama”, 27 May 2014. Available at: http://bit.ly/1uHyTZc.